This area is for items that have been requested by our clients. Are you selling something that we might want? Just some feed back. I recently bought 11.5 sq mtrs of your 11.5" oak floor and loads of proper nails. It's all laid now and it's fantastic really looks great. Thanks again, your service is great, I have recommended you to some of my friends as well. APPROX. 100 SQ.YDS. at the moment with more to come. Sizes: Example shown in picture. 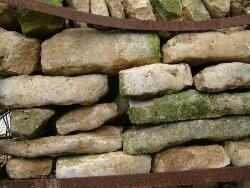 of the Cotswold stone stable cobbles as below. We will take them in small or large quantities. 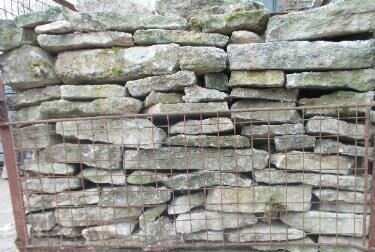 Reclaimed "Cotswold Stone Stable Cobbles". TESTIMONIAL : From someone we bought from. Reference : Reclaimed plain roof tiles. Once again thanks for your prompt service, really impressed all around. I am happy to accept your count as it’s ballpark what I estimated. Was your colleague called Trevor (loads of trades around at the moment and sometimes muddle them up). Very nice guy and courteous. 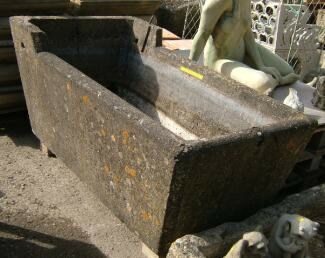 We’re really pleased with the stone that Bruce ordered from you, which was delivered on Tuesday. It’s just what we wanted in size and quality and to match for what we have. Bruce is already laying it now and I’m sure it will look lovely. The stone is all laid and looks lovely. Reference : Farmhouse style three boarded and ledged doors with a waxed finish. Everyone that has visited since the other doors were hung absolutely love them! … haven’t hesitated to promote your business! All arrived & driver was incredibly helpful. Only seen a couple but they look amazing! It's a genuine thank you as from me sourcing thru to your delivery you've been so helpful. The York Stone is looking amazing. I hope that you and Maggie get the chance to come down here at some point when it's all done and have that glass of wine and some food in the garden !!!!! Thanks so much for all your help and prompt deliveries. The York stone looks excellent. A Limited Edition of 50. 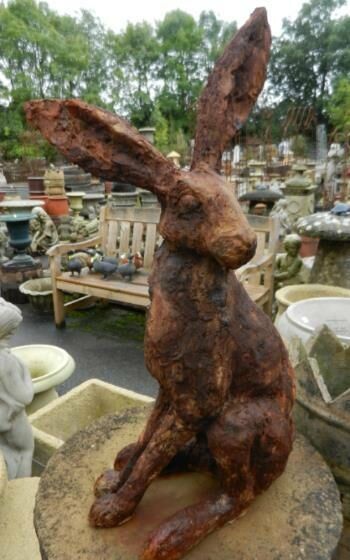 "Sitting Hare" created by a local sculptress. To date 29no. have been made. These are showing to be very popular and are selling quickly. For more details see heading "Statuary,Metalwork"
Just to say that the roof is looking great - really beautiful tiles! 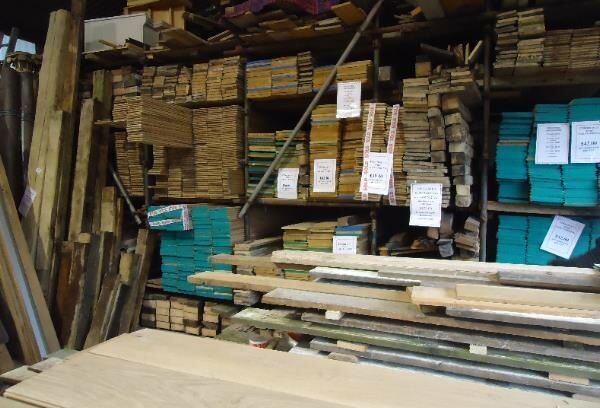 Out of interest do you have any salvaged / reclaimed oak flooring in stock - we're after around 33sqm? which we currently have in stock. 6 3/4" (170mm) wide, & up to 11 1/2" (290mm) wide. 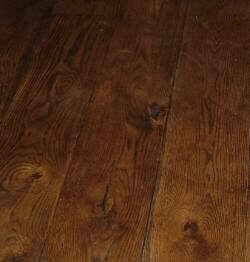 "WE SPECIALISE IN WIDE BOARDS"
New "Rustic" grade oak flooring. 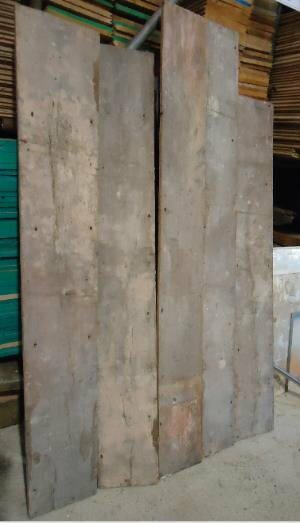 This board is very popular due to it's character grain and large knots. 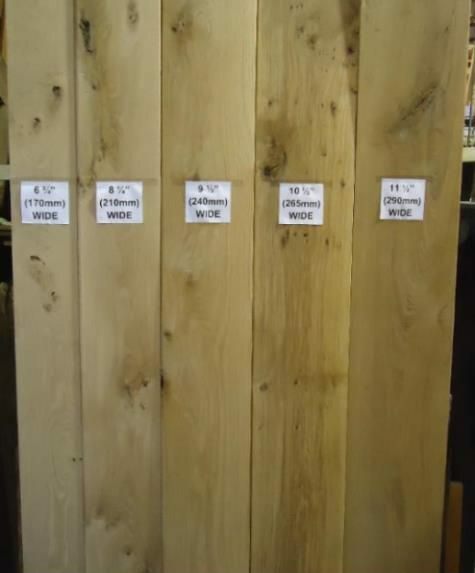 The 5 widths of board available are listed below and those illustrated in the top picture, on the left, indicate the general quality of the boards we normally have in stock. if they are purchased from the same batch. The boards in the lower picture show a 9 1/2" wide board fixed, with cut nails & finished with a "Dark Oak" waxed finish. We can recommend our suggested method of fixing and finishing and this can be discussed if you wish to contact us, or we can email, or post a copy to you. Pictures & Prices upon request. 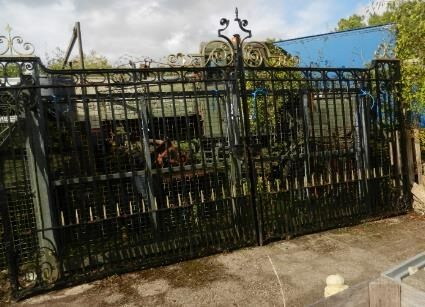 A pair of hand crafted wrought iron gates. Reclaimed from a local private school. (9ft.) height to its highest point. 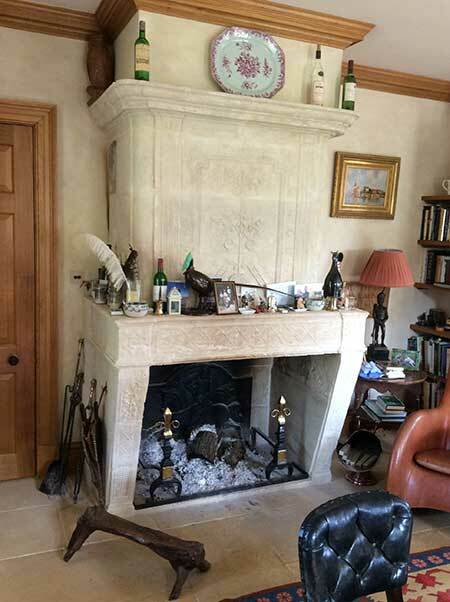 BETWEEN 100-150, NEW AND RECLAIMED, FIREPLACES, SURROUNDS, BASKETS AND FIRE DOGS ETC. ETC. ETC. 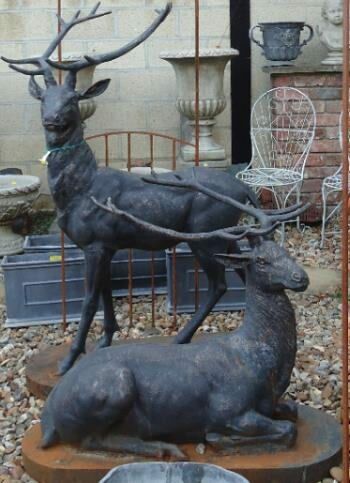 GARDEN STATUARY, POTS, URNS,FLAGSTONES, BENCHES, METAL GAZEBOS AND ROSE ARCHES ETC. ETC. ETC. 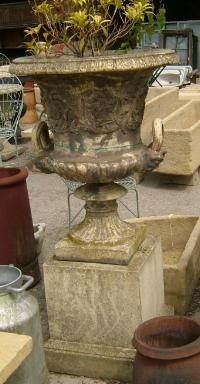 STATUES, URNS, PLINTHS, POTS ETC ALL MARKED UP AT DISCOUNTED PRICES. 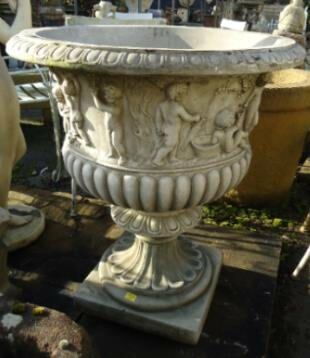 We also have a good selection of reclaimed sanitoryware, fireplaces and fire surrounds, kitchenalia, pottery, glassware, antique and old furniture and more in our 4000 sq.ft. warehouse. 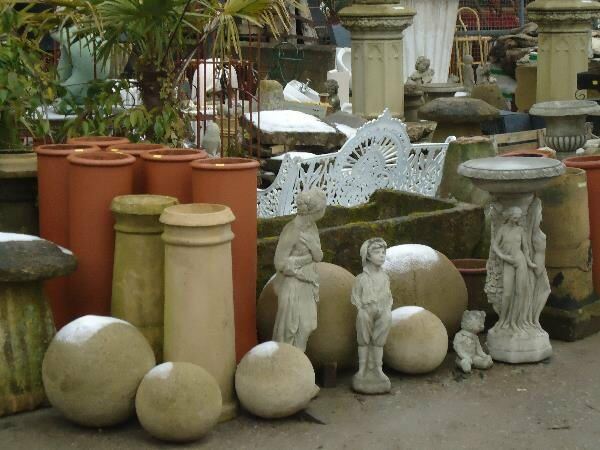 For the garden, we have stone and reproduction garden ornaments, old terracotta pots, Antique & reproduction staddle stones, stone troughs, metal & cast iron benches, wrought iron Rose arches and gazebos and much more. 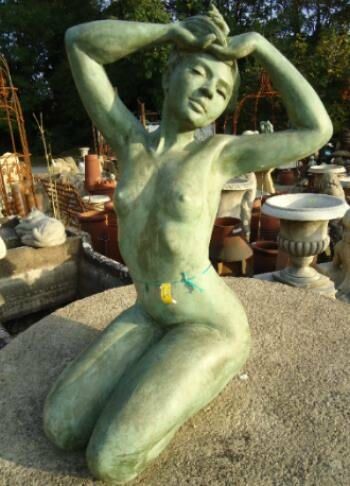 FOR MORE INFORMATION OF THIS PRODUCT LOOK UNDER HEADING : "STATUARY"
it is nearly impossible for the website to be totally up to date. especially before making a trip to see us. per square yard plus VAT. currently in stock, and are buying more. THIS HAS A LOVELY COLOUR TO IT. If you require anything for a building, garden or renovation project (especially if it's a bit different) please email us and let us know what you require. Our stock changes daily, and it is almost impossible to keep the website completely up to date. If it's not on here it doesn't mean we haven't got it! We get between 60/80 phone calls and emails every day through which people try to sell us items. It might be the just the thing you're after! If you email us we will get back to you letting you know that we have it in stock. If we have been offered that item, or get it in stock, we will let you know about it straightaway. "THIS IS SELLING VERY QUICKLY "
NOTHING CAN BEAT A REAL OPEN FIRE. 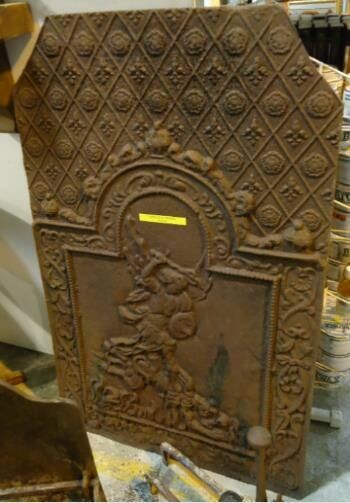 WE HAVE A GOODSELECTION OF ANTIQUE, RECLAIMED, AND REPRODUCTION FIREPLACES, SURROUNDS, INSERTS, FIREBASKETS, FIREBACKS AND ACCESSORIES IN STOCK. WE HAVE MORE ARRIVING CONTINUALLY. This is the smallest of 4 no. in stock. 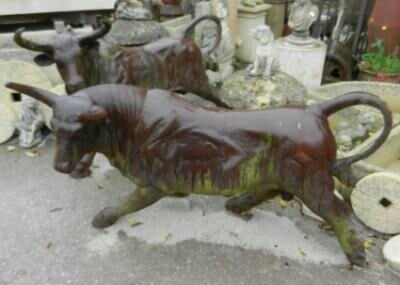 FOR MORE INFROMATION PLEASE LOOK UNDER HEADING ; "FOUNTAINS"
Stonemarket provide the finest selection of high quality landscape products to help you create a beautiful garden. 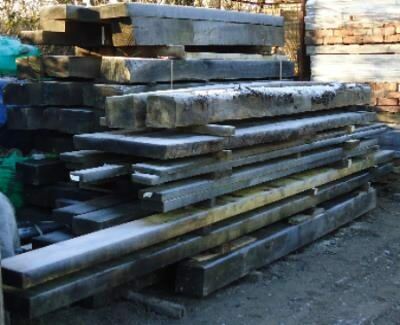 We can supply almost anything from Stonemarket. Please see their website for more product details, images and prices. WANT TO MAKE AN IMPRESSION ?? or NEED PROPS FOR A SCHOOL PLAY OR THEATRE PRODUCTION or ANYTHING ELSE WHERE YOU DON'T WANT THE EXPENSE OF PURCHASING THE ITEMS YOU WANT TO USE. welcome visitors into the marquee. We have also rented various props for local school plays. Have a look on "HIRING/RENTING OF GOODS" on the Home Page above. Reclaimed from the garden of "The President's House" of one of the older Oxford Colleges. 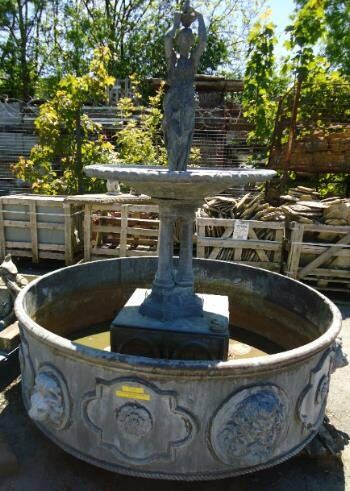 DESCRIPTION : An antique, weathered, 2 tier cut stone, semi circular garden feature, made from natural stone with "Scotia" type detail cut to each side of the top of the stones. SIZE : The diameter is approximately 6.1 metres (20') acrross with steps from one level to the other at 2/3 points across the circumference. 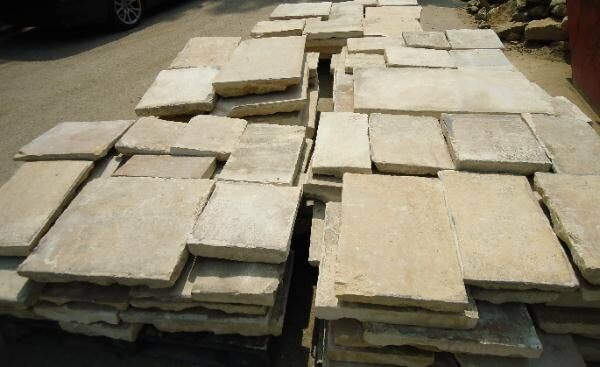 Each piece of stone is about 1.1 metres (3'8") in length by 0.45 metres (18") thick. The overall height from ground level to the top of the 2nd tier is approximately 0.6m (24") high. THIS HAS BEEN TAKEN TO PIECES WITH LOVING CARE AND IS IN VERY GOOD CONDITION. An original photo can be provided upon application. Photos are in "BUILDING PRODUCTS"